Raised in Montreal with Dr. Doolittle for a mom, the love and nurturing of domestic and wild animals was established at a young age; from geese and goats in the suburban garage, to ferrets, parrots, lizards, raccoons and dogs (and everything in between), we were exposed to all kinds, and loved it! Prior to beginning my post-secondary studies, I traveled and worked in Costa Rica as a park ranger at two national parks, one of which was a macaw sanctuary. It was in 1997 that I laid down the backpack, moved to Ontario and began my post-secondary studies. In 2001, I graduated with a Bachelor of Science (Honours) from the University of Waterloo. Having also had an interest in health and the body from a young age, it was natural that a gravitation toward Chiropractic should eventually occur. However, the hands-on aspect of the profession also appealed to the artist in me, and the engineer-inherited aspect of my brain was drawn to the biomechanics and neurology aspects. After four demanding years of study at the Canadian Memorial Chiropractic College in Toronto, I graduated with a Doctor of Chiropractic in 2005. 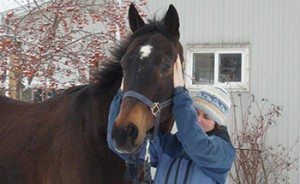 It was in my final year at CMCC that I learned about the possibility of treating animals with Chiropractic. The fact that I would take the extra training was inevitable; the question was when? Immediately after graduation, my husband and I moved to London, UK for some interesting work and travel experiences. 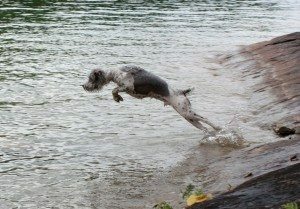 A year and a half later, we returned to Canada and had our first fur-baby, Milo a miniature schnauzer/poodle mix. It was in 2012 that I finally completed the Animal Chiropractic Certificate Program, becoming a member of the College of Animal Chiropractors, and my practice has been all the richer for it! I feel incredibly fortunate everyday that I have the opportunity of helping to ease the discomfort that an animal has been silently (or not so silently) living with. Knowing I am a part of an athlete’s increased performance, or an older animal’s renewed enjoyment of life has been incredibly fulfilling. I feel equally fortunate to bring hope and an increased quality of life back to the people that care for these pets, as it can be as equally distressing to them to see their pets struggle. Needless to say my belief in Chiropractic is strong, but so is my belief in an animal’s medical needs. It is for this reason that it is my preference to work closely with the animal’s primary provider, his veterinarian. In my opinion, it makes for the best, most complete care. 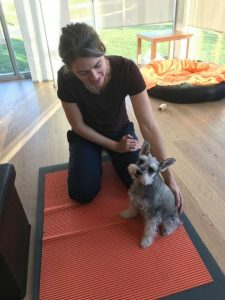 Finally, I’d like to say that if you are even remotely curious about the potential health benefits Chiropractic can have for you or your pet, please continue to explore this website. If you have any further questions, please do not hesitate to contact me. Together, let’s bring out the best in you and your pet!